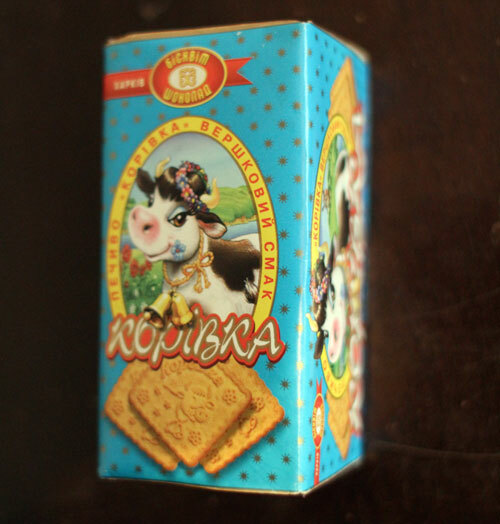 The biscuits of Mongolia project, #2. Packaging languages: Ukrainian and Russian. Mouthfeel: shattery, burnt caramel undertones, strangely smooth. These look tastier than the other ones... I'd recommend trying them with a glass of milk. I'm very fond of the friendly cow. WHERE are you acquiring these strange foods? So, how hard does a Pechivo Korivka Vershkovii Smak hit? Elaine: I'm not! L&TM5K Ambassador to the Post-Soviet Fringe Meaghan is, at the local store I assume. I think they are too wonderful not to repost.